Watching the endless television coverage of Pope (now emeritus) Benedict’s resignation and exit from Vatican City gave me a powerful taralli craving. I discovered taralli, a southern Italian variant on the salty-crunchy theme a few years back, thanks to a friend living in Rome. She warned me that the olive oil enriched cracker/pretzel hybrids were addictive, and sure enough, I never managed to leave Italy without a bag or two in my suitcase. 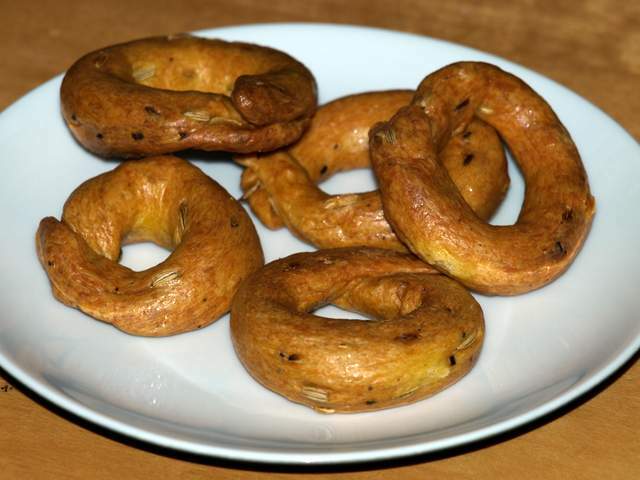 Taralli are hard to find in the US; they occasionally show up at gourmet stores and are sold online by Zingerman’s. But my craving wasn’t going to wait for mail-order: I needed to make some from scratch. Fortunately, Susan over at Wild Yeast Blog tackled this recipe years ago, borrowing from another recipe. I subsequently adapted her version to suit my tastes. My part whole wheat version is loaded with fennel seeds, but it’s easy to substitute grated parmesan, sesame seeds, or poppy seeds for a different flavor. Heat oven to 390 degrees. Bring 6-8 cups of water to a boil in a saucepan; keep it boiling while you mix and shape the dough. Stir together the yeast and 2 T of the water together in the bowl of a stand mixer. Add egg and olive oil; mix with paddle attachment until well blended. Next, add all purpose and wheat flours, fennel seeds, black pepper, and salt. Begin mixing the dough and add the 3/4 cup water, a small amount at a time, until a cohesive dough forms. If dough seems extremely dry or crumbly, add additional water 1 tablespoon at a time. Dough should be firm but malleable. Divide dough into four portions. Roll each portion into long, skinny logs about 1 1/2″ in diameter. 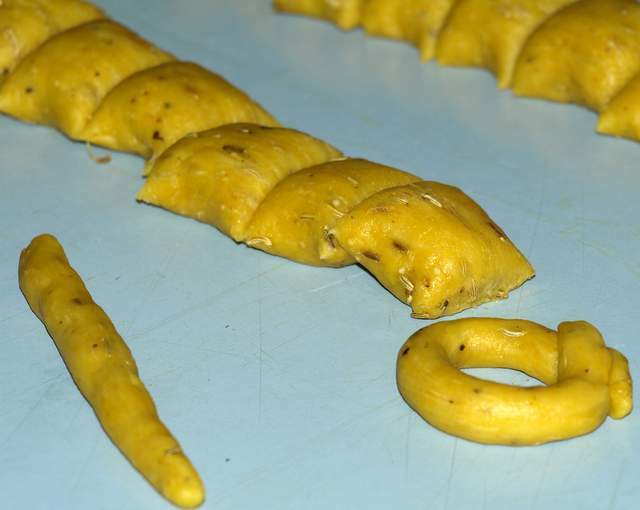 If fennel seeds fall out, simply press back into the surface of the dough. Cut each long, skinny log into 1″ portions. Roll each 1″ portion into a smaller rope about the thickness of your pinky finger. Curve each small rope into a circle, pressing the ends together lightly to adhere. After all dough portions are rolled, place shaped rounds into a pot of boiling water, 6-10 at a time, depending on the size of the pot. Once rounds float to the surface, place them on parchment-lined baking sheets. Bake for 30-45 minutes, until deeply browned. Cool on pans, then store in an airtight container. Keeps for 4-6 weeks.